As you probably can tell I love printmaking, it is a medium I hadn’t expected to love so much. 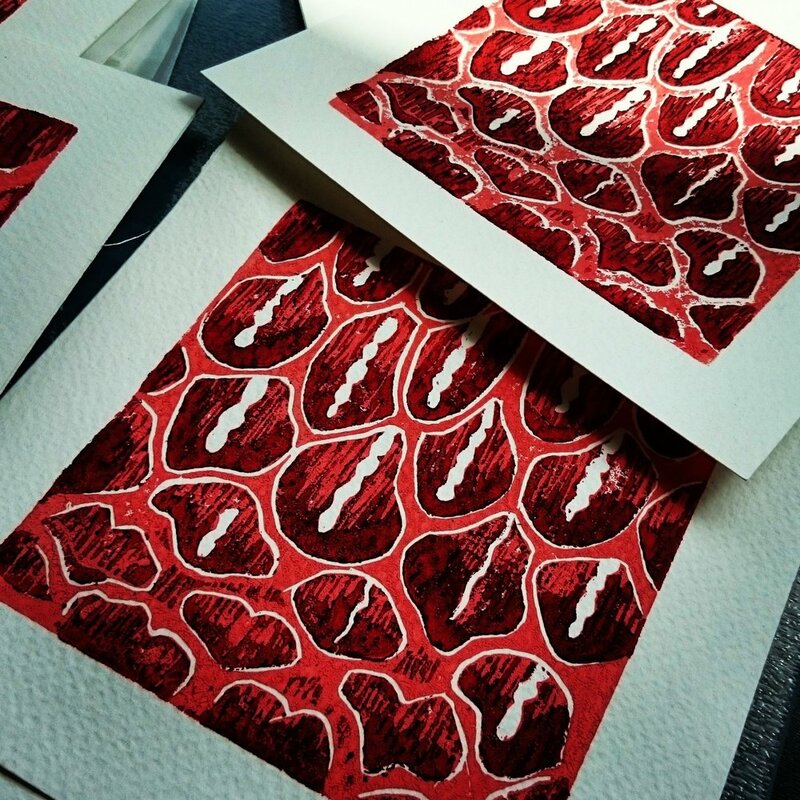 I a member of a few Facebook groups and following some amazing print artists on Instagram. I’m in total awe with the details some artists achieve with their prints. I started off small, from humble printing beginnings with just polystyrene plates and acrylic paints now with a nice collection of tools and lino I have upgraded. I still feel like a newcomer to the medium, there is so much to learn and discoverer. I decided I wanted to put some of my prints out into the big wide world and joined a print exchange. After a bit of self-doubt, I decided at some point everyone is a total novice and without showing what you’re doing you’ll never improve. The other appeal for me to do the print exchange is so I get a piece of art from 8 other people. I am really excited to own someone else work and lucky for me I should be back in the UK when the exchange prints are sent out. My initial plan was to send my previous skull linocut and do a simple reduction print. Sadly the print was too big to meet the criteria for the print exchange. The printed image is to be a maximum of 10cm x 10cm, this was the first challenge for me as I had wanted to make something with lots of detail but in the end with the confines of the 10cm I opted for something more abstract. I have been looking at coral as part of my research for my pathway stage of my fine art project, this seemed an ideal way to combine something for fun and work towards my coursework. I chose a copyright image from Flikr of close up detail of coral. I selected a small section of the coral enlarged the image to make a simple abstract. I chose just to do a simple two colour reduction, the paint I was using was a printing ink and the paper was an archival safe watercolour paper. I had some issues with the thickness of the paint if I applied a thin layer as I had intended the paper adhered to my lino and ripped as I tried to pull a print. I tried dampening the paper but that just resulted in a runny print. In the end, I had to compromise and apply a thicker layer of paint to my lino. These are the final editions all ready to be signed. In total, I produced about 25 prints which gave me a few to choose from to enter into the print exchange. If you missed this year's entry you will have further opportunities to enter each year they host a new exchange http://ipe.greendoor-printmaking.co.uk/ It cost £15 to join and that covers the postage when they send you your return prints.